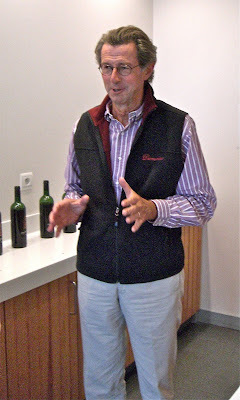 On the same visit to France in October, I got to spend a delightful hour in the company of always gracious Christian Moueix (below, standing in his laboratory), and you can read all about that at Wine Review Online. So that's my double dose of Right Bank links for the day. For me, 2010 is starting out to be an excellent vintage, but we'll just have to see how it develops. I certainly hope for a long finish, with good fruits and no bitterness. I wish I could say I felt joyful tonight, but the Massachusetts Senate result has me pretty morose. Apparently the Democrat ran a lousy race, even calling Curt Schilling a Yankee fan when he dissed her. So maybe the voters genuinely picked the better candidate. I'm trying to feel a positive spin on it because I now foresee absolutely nothing getting done in Congress for, what, ever? Maybe? The Republicans have made it clear they will be purely obstructionist, but I don't see the Democrats losing 10 seats this year so it's not like the Republicans will take over and push their own agenda either. I'm very depressed over this. I didn't love the health-care reform bill, but nobody did, and I strongly believe -- and have for years -- that health care is our biggest issue and we have to address it. This probably kills the whole bill, ends a year's work, and just as when Hillary Clinton failed, takes health-care reform off the table for more than a decade. I'll tell you who's partying tonight -- health insurance companies. I'm rambling here, but if the Republicans were a responsible party of conservative views, this one election wouldn't matter much. We could use such a party. But the Republicans of Michael Steele and Rush Limbaugh are not that, they've become little kids who just say no to everything. Unfortunately that does represent the political views of about 30% of Americans. And with the tea-party morons on the rise, things will just get worse. Yes, stay with the wines for a happy palate. At least 30% of your fellows are like the dregs in your wine casket, or at least their so-called thinking is. Just visit The People of Walmart online to get a feel. p.s. -- congrats on your story. I'm sure you've gotten over this by now with the supreme’s making the out come of this election nothing to talk about. 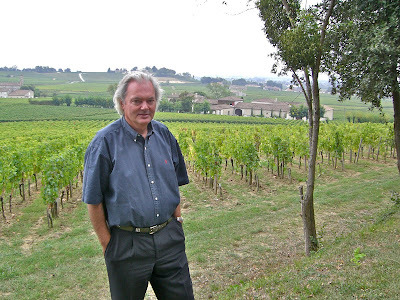 Thanks for the links/stories and my we all drink better wines at good prices. Hi guys. Yes, Jo, you're absolutely right -- if I want to be depressed about the future of our democracy, the Supreme Court decision giving corporations the same first-amendment rights as people does the trick. Even Roberts was embarrassed by that one. Drink the good wine now, that's my thinking.